TREADMILL RUNNING – Make sure you warm up at a slower pace for 5-10min. Because treadmill running is easier on your body it is a great way to push yourself with having the confidence that it is not putting too much stress on your joints like road running. When ready enter in the correct speed, make sure that the safety button on the treadmill is working incase you need to stop suddenly. Set the treadmill on the desired pace. REST 5-10 SECONDS BEFORE EACH RUN. Grab handles on the side of the treadmill and slowly step off whilst the treadmill is still on. After resting use the same method to get back onto the treadmill. Put your hands on the bar with your palms facing your body. 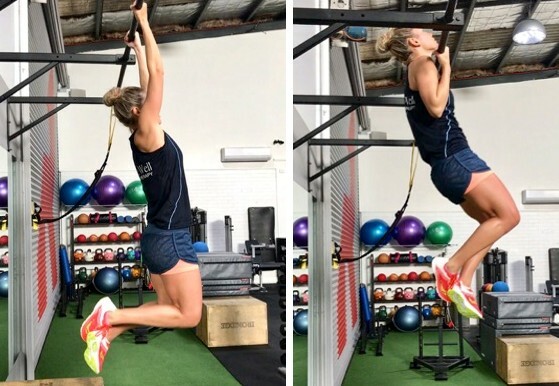 When you have the correct grip pull your body up towards the bar, stopping when your chin is just above the bar. Your elbows will be fully bent. Bend your knees to distribute your weight more evenly. If you struggle pulling your body weight up use resistance bands to aid in this until you are strong enough to do them alone. 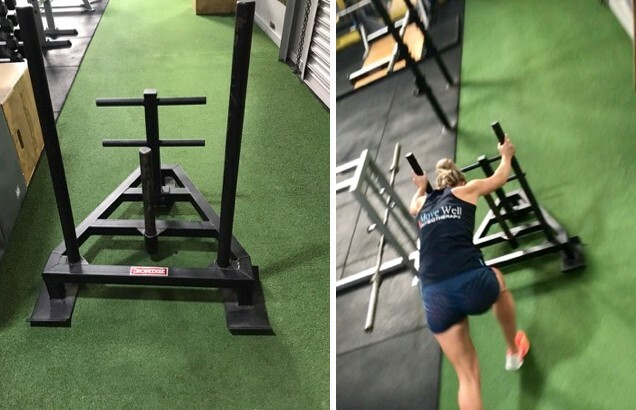 Start in an athletic posture, leaning into the sled with arms fully extended. Push the sled as fast as you can focusing on driving through your glutes. Hold the end of the rope about arms length away from your body. Feet should be slightly wider than hip- width apart. Tighten your core, bend yoour knees slightly. Raising and lowering your arms like making waves with the ropes. Repeat 20 times and do 2 push ups. Another 20 times and do 4 push ups. The reverse lunge is great for developing athletic power. Do this without weight to start. When ready lunge backwards holding this position then kick your back leg through to engage your trunk. Then return to starting position. The shin is more vertical during the step-back lunge, with the knee a good distance back from the toes. Attach extra weight on the bar as this will be more unstable and will force you to engage your core muscles.